And she’s not amused. Here. “#notallabsorbingmen” hahahhaahahhaha, that’s really good! I can’t stop chuckling about this. Aaron’s Thor has been great both pre and post the new Thor. Sigh. The problem with new “Thor” isn’t that she’s female. There are plenty of female superheroes. The problem is that they outright replaced an existing male character with a female one and even stole his name in the process. If people wanted a female Asgardian hero, they should have invented a new character. This models the way feminism works in real life too. Feminism is nothing new. Good men have always believed in respecting women. All feminism did was hijack the idea, add some crazy to it, and call it “feminism”. 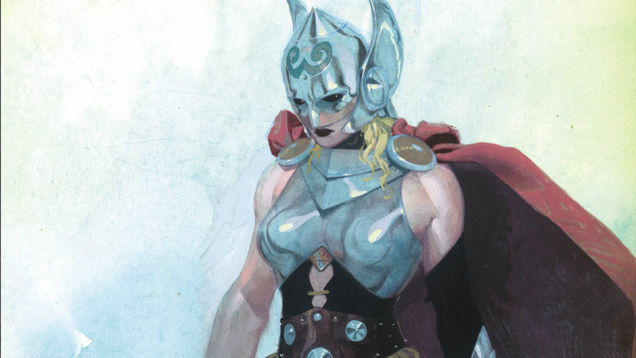 By the way, what exactly makes new Thor female? The long hair? The breasts? Those are all gender stereotypes. What about girls with short hair and flat chests? Are they not female??? Comic characters get ‘replaced’ all the time. This is more of a function of the fact that they are role bearers (or mantle-bearers) rather than specific individuals. This happened for instance to Flash, Green Lantern, Spiderman, and even Thor who was once the alien Beta Ray Bill. Sometimes, this means a gender switch, as with Captain Marvel. There’s usually a story line behind this. In the case of Captain Marvel, it was a case of one dying and being replaced by another ( the previous Miss Marvel, now leader of the Avengers). In the case of Thor, the editor, Will Moss tells us that: “This change wasn’t made just to add another female hero to the Marvel Universe, it’s a change that comes from the Thor story that writer Jason Aaron has been telling. . . We can’t tell all the story secrets at this point, but once the whole story is out there, it will become clear why this woman has become the new Thor.” Perhaps Odin will disinherit Thor and pass the hammer on to one of the existing Asgardian female heroes, perhaps he will put down the hammer to settle with Jane, and a ‘worthy’ woman will be able to pick it up and thereby become Thor. Let’s wait and see. I agree that perhaps the bustyness of the new Thor is overdone, and that comic artists seriously need to rethink the way they draw the female body – but I believe this has been said before. I won’t comment on your point about feminism – bored now. (Seriously, we’ve heard this all before and won’t be publishing responses to this part of your comment). Anon: this not entirely relevant to this particular post, but important, I agree, so I gave it its own post.